We are very pleased to welcome Dorothy Legro to the team at camp. Dorothy will be serving as the Camp Registrar at Brookwoods, Deer Run and Mooser River Outpost. Originally from Massachusetts, Dorothy has a host of fine customer service experience with several professional firms. She moved to Alton a few years ago with her dogs, Ben and Jerry, and enjoys gardening and spending time with her family and church friends. The Registrar is responsible for working with parents in getting our 1000+ campers signed up for each summer. 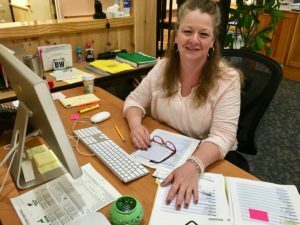 Dorothy will be serving you with a smile on her face, which you can almost hear, if you give her a call at the camp office with questions or concerns.